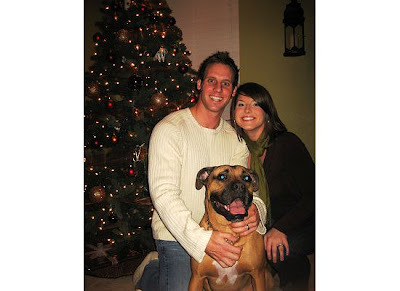 This is our Christmas Picture for this year… we had to take it the Ghetto way (Point & shoot- on a timer- balanced on a bar stool haha) And Oh boy, was it tricky to get Bishop to look ahead and not lick out faces. I had to get him focused on a ball he likes and then I set the ball down next to the camera… it worked! 🙂 Not the greatest shot, but we were crunched for time and had to make do with it. We’ll get Katie to take it next year! Monday: Taco/Taco Salad Night (Mike does Tacos… I like mine in Salad form) with all of the fixins! Hi im autumn i live in illinois and i really love ur blog. im an authentic christ-follower and i just wanted to say congrats on your wedding. come visit me @ www-livelifewithnoregrets.blogspot.com and leave a comment.